Discussion in 'ESET NOD32 Antivirus' started by LinkTree, Sep 22, 2008. Hello, I have a very annoying problem with my NOD32 antivirus. the top image in the interface is always missing and it bugs me very much because there used to be buttons on that image and now they blend with the white color. My version of nod and every version I've installed for friends has looked exactly like yours, given I just started using a few months ago, but as far as I know; that's just what it looks like. I may be wrong but the only thing I see wrong with your pic is that your signature database is from 2007 lol. Since I installed and uninstalled the program few times, trying to fix this I got tired of it, and haven't installed it again until I will find a solution for this. and since I don't have the program right now on the computer I had to edit a picture I've found on the internet to let you understand whats the problem. and that's why the virus database is not up to date. at least now I know I'm not the only one experiencing this problem. What version do you have installed? Does deleting the HKEY_CURRENT_USER\Software\Eset\ESET NOD32 Antivirus\CurrentVersion\Client key make a difference? 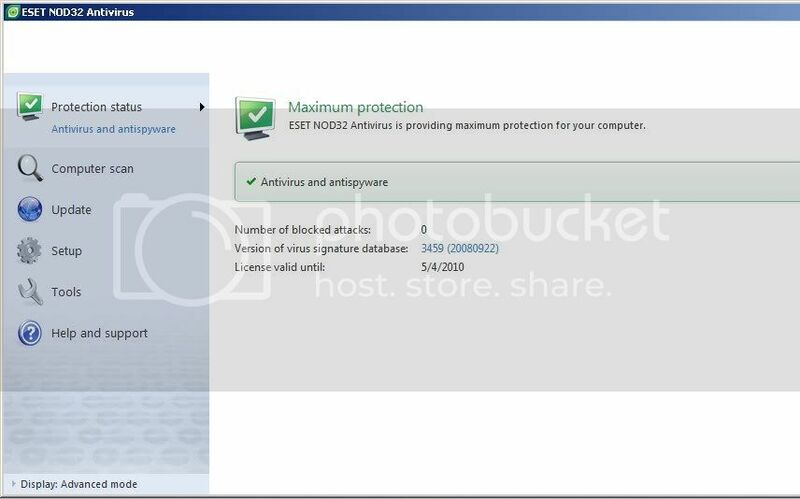 Please download a fresh installation package of ESET NOD32 Antivirus from ESET's web site with your licensed username and password, uninstall the currently-installed version, and then install the version you just downloaded. Does this solve the user interface problem?